Barely any other barebone is offered under so many different predicates as the M570 from Clevo. It's not very surprising, as it is a chic 17 - inch notebook always on the newest stand of technique and therefore especially of interest for performance - enthusiasts. 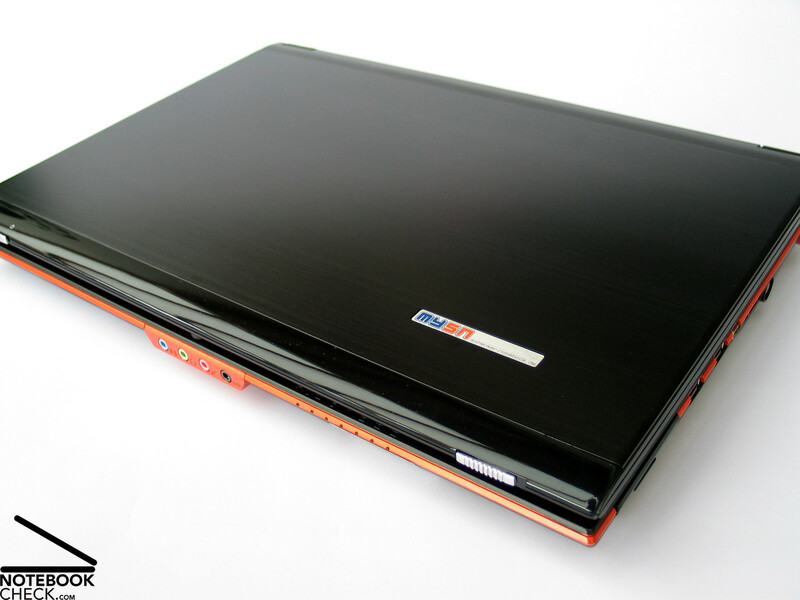 Schenker brings the M570TU as mySN SMG7 gaming notebook out, equipped with Intel Core 2 Extreme X9100 CPU and a brand new 9800M GTX graphics card. Note: The mySN XMG7 is the same as the Clevo M570TU barebone which is identically constructed as the already tested Clevo M570RU barebone. That is why the following pictures originate from this review. As already mentioned, the mySN XMG7 is a barebone out of the Clevo M570 series. 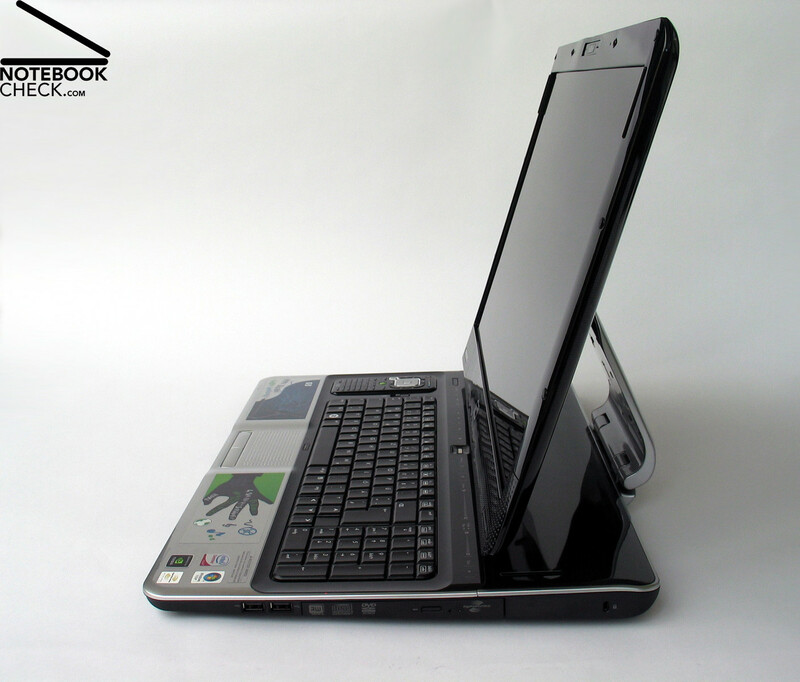 Therefore the notebook case is similar to the devices based on the same barebones. 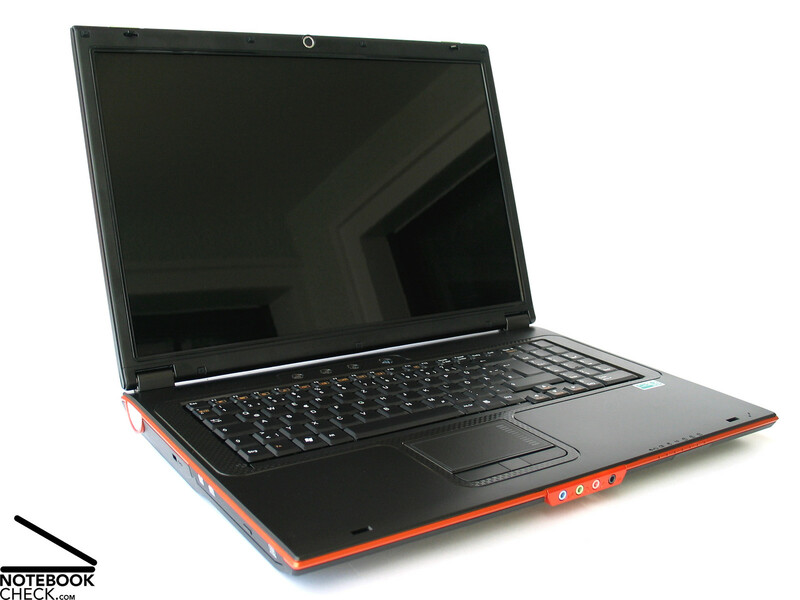 For instance, the Nexoc E705III, the Deviltech HellFire m800, the Guru M570TU or even the One G8530 notebook. The case shows itself fundamentally rather modest. 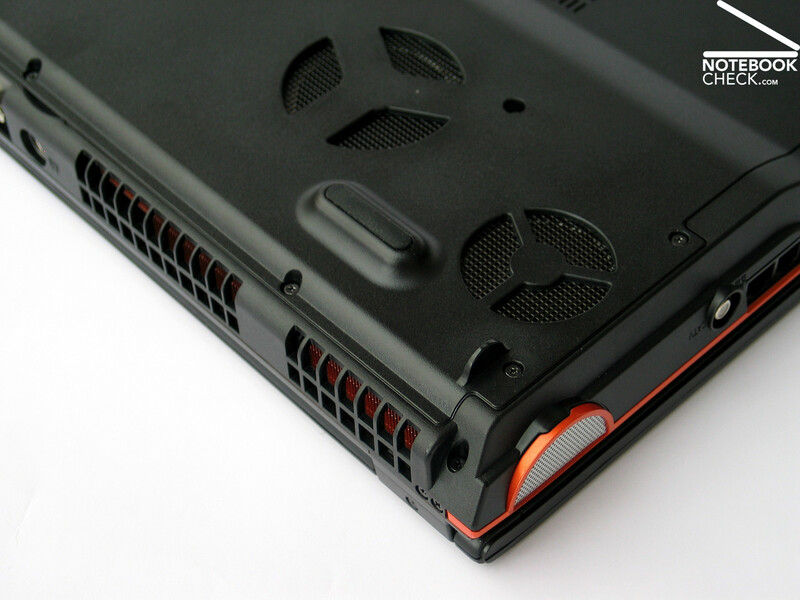 Distinguishing is above all the orange colored border which runs on the side edges around the case and, though this, gives the barebone a strong recognition feature. 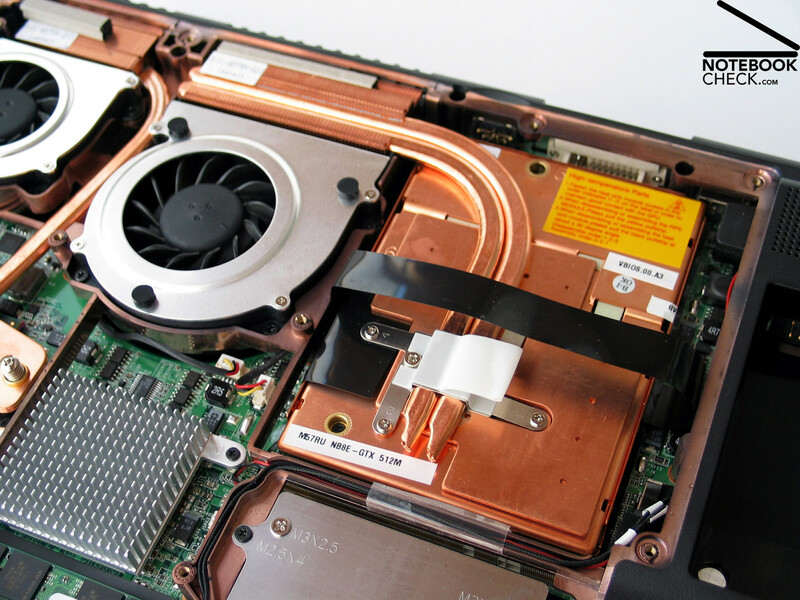 Regarding the workmanship, the barebone cuts off passably whereas looking at the individual manufacturers slight differences in assembling quality due to dissimilar tests can be found. 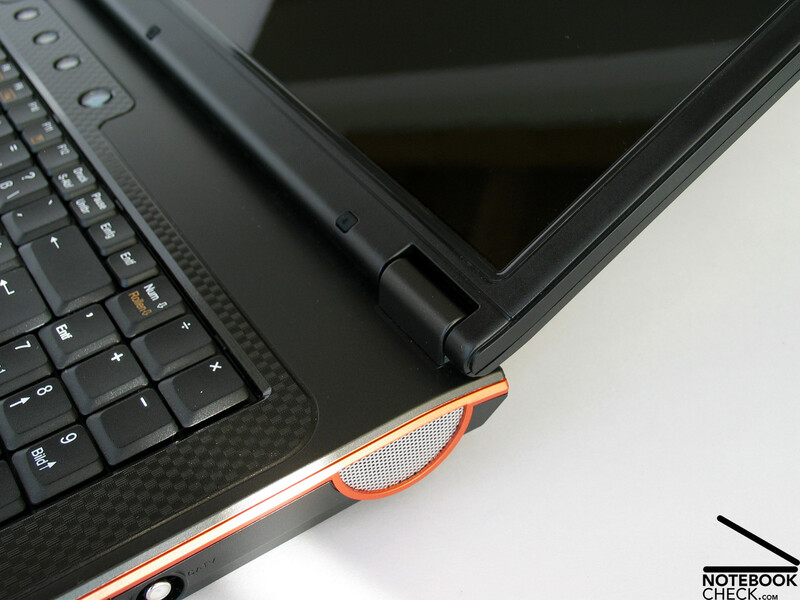 You can find more specific information about the case in our detailed review of the mySN M570RU notebook, which is the identically built forerunner of the new M570TU version. In consideration of the offered models there are barely any differences in the connectivity, either. 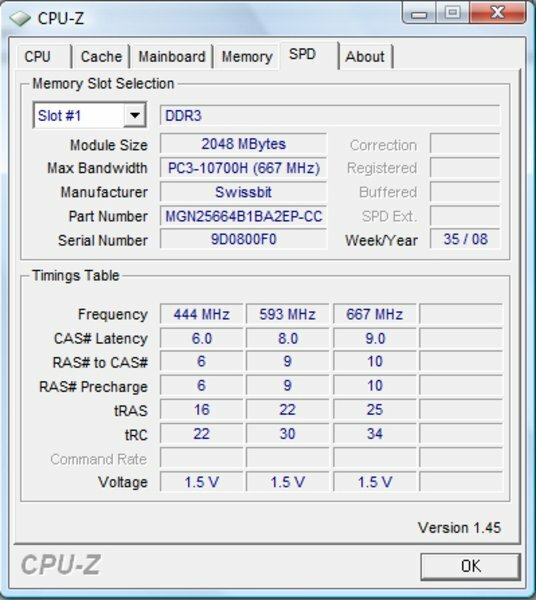 In comparison to the somewhat older models of the Clevo barebone M570RU version there has been some progress. Besides the established DVI port the M570TU has now an additional HDMI out as well as an eSATA port for connections to an external hard disk, found on the backside of the case. Consistent is the connection possibility on the right side of the case, where two USB ports in the front area are found, followed by a fire-wire port as well as a modem and a LAN connection and a port for an antenna. 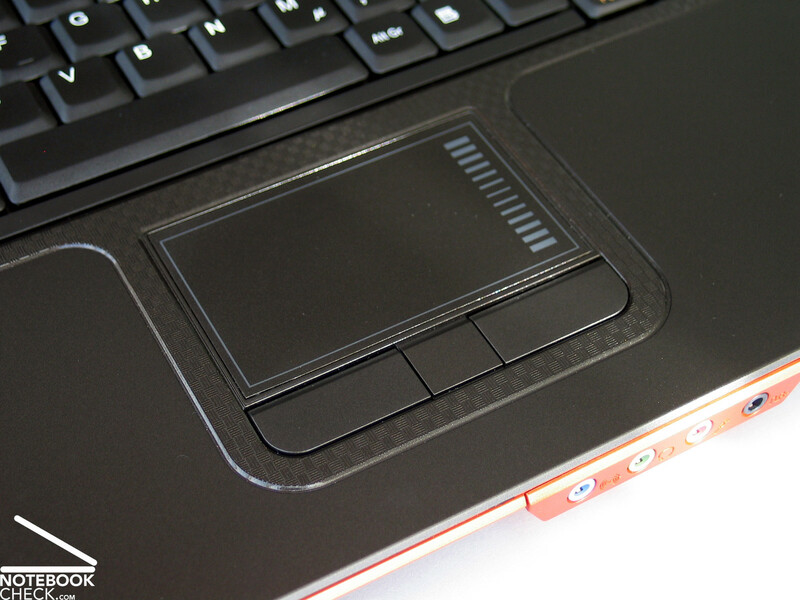 Especially the two USB ports are not optimally positioned because when these are occupied, they can constrain the working area on the right side of the notebook considerably. Respectively the left side turns out more favorable because only the optical drive and the Kensington lock are found here. In view of communication a bit happened in the new M570TU, as well. Thanks to the newer Centrino 2 technology from Intel, the XMG7 is already equipped with an Intel wireless WiFi Link 5300 module. This supports a data transmission rate of up to 450Mbps while with the likewise new 5100AGN module an information flow rate of up to 300Mbps can be reached. In the wired communication the XMG7 offers a Gigabyte Ethernet port from Realtek (RTL8168C/8111C). Besides this a Bluetooth V2.0 module belongs to the standard equipment. 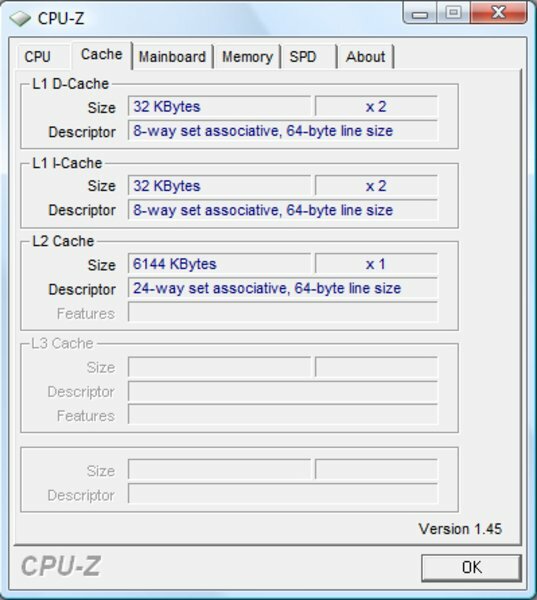 As optional features an Intel Turbo Memory module with 1-, 2-, and 4GB or a DVB-T MiniPCI Express card may be mentioned as an example. 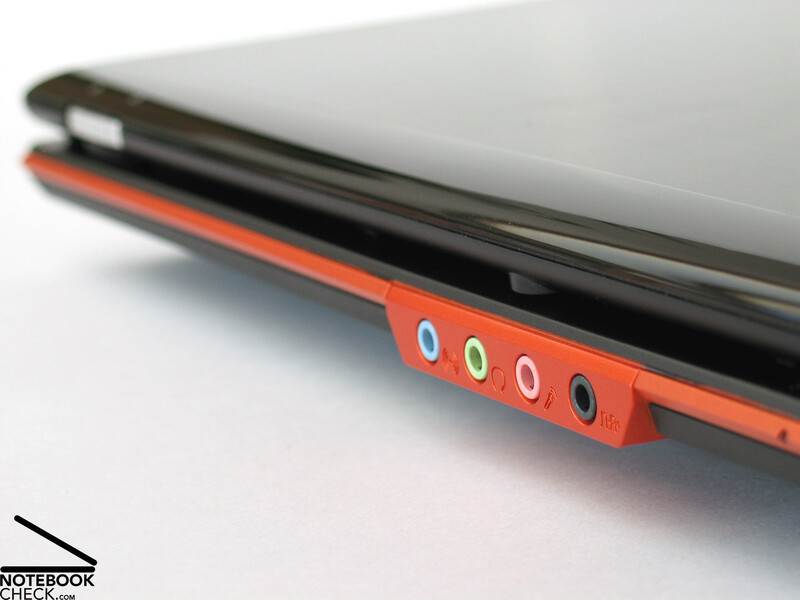 A BluRay drive is also available for the XMG7. In the warranty Schenker assures a 24 month basic - guarantee with a pick-up and return service. For an extra charge of 160.00 Euro, this can be extended for a maximum of three years. 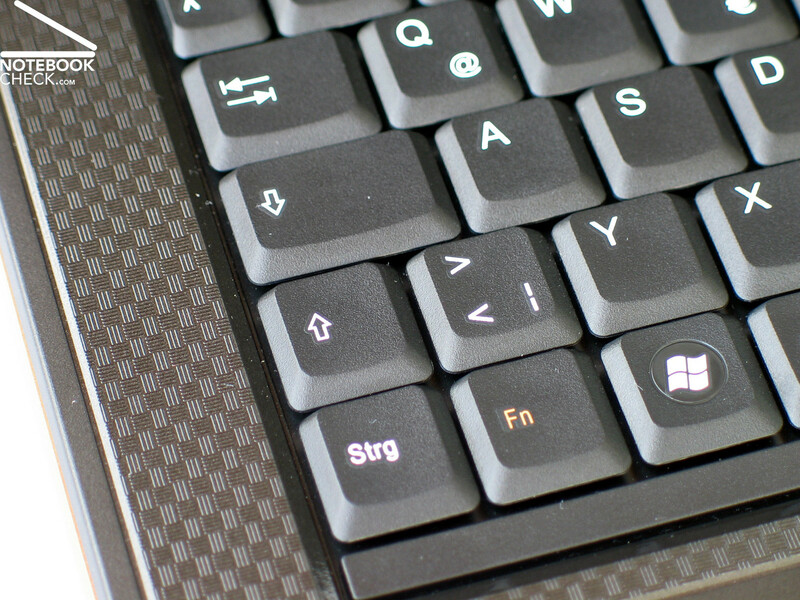 There are no changes to be found on the keyboard of the Clevo M570 bare-bone. 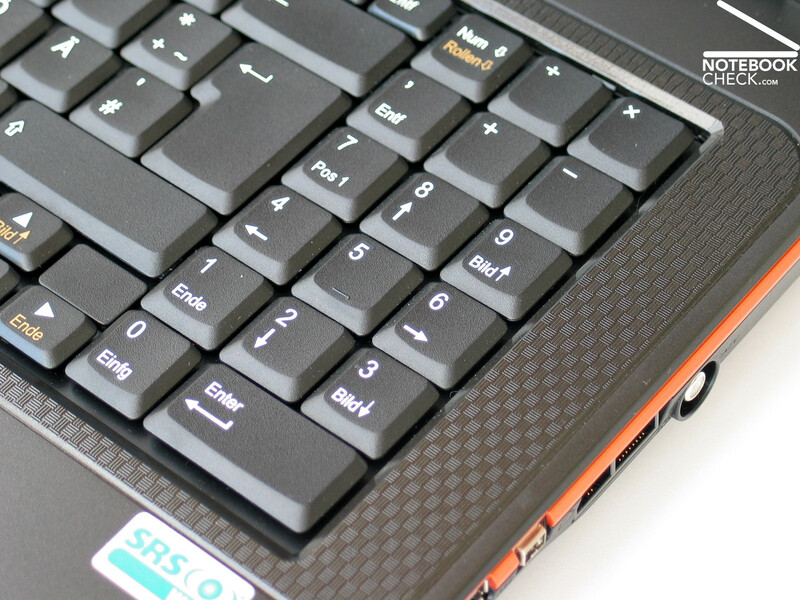 As supplied before, a well-arranged keyboard with an additional numeric block is found. The keyboard could convince in practical use, in particular the extremely pleasant stroke reaction during typing is to be mentioned here. 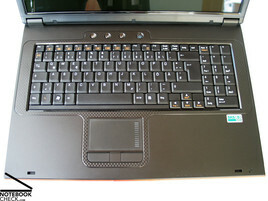 Further details can be found about the keyboard, and about the touch pad as well, in the review of the identically built mySN M570RU notebook. A WUXGA display with a maximal resolution of 1920x1200 pixels finds appliance as the screen of the mySN XMG7 from Schenker. 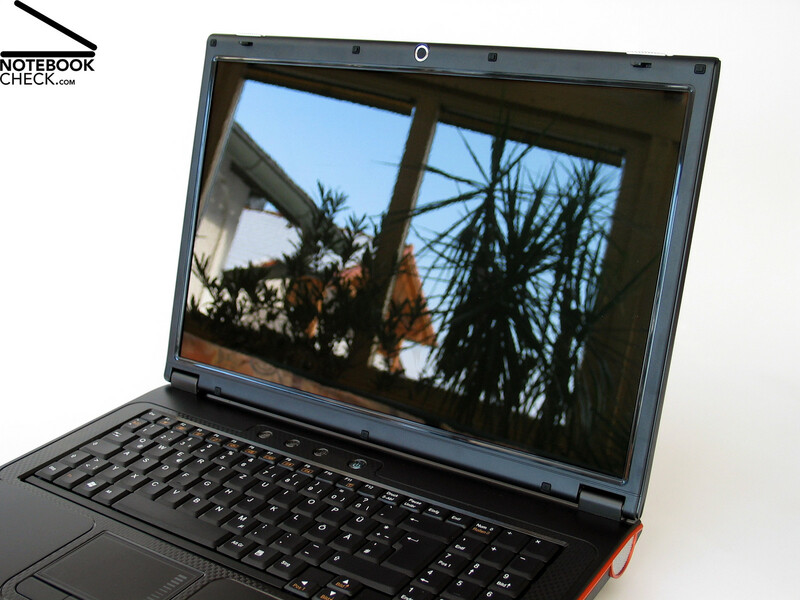 With this, the notebook offers the best resolution results and a very good overall view on the display when working with more than one window. The panel shows itself with a glossy glare - type surface which on the one hand works out positively on the color elucidation but on the other hand is responsible for inconvenient reflections by unfavorable lighting conditions. Not very convincing were the measuring results of the XMG7 screen luminosity. 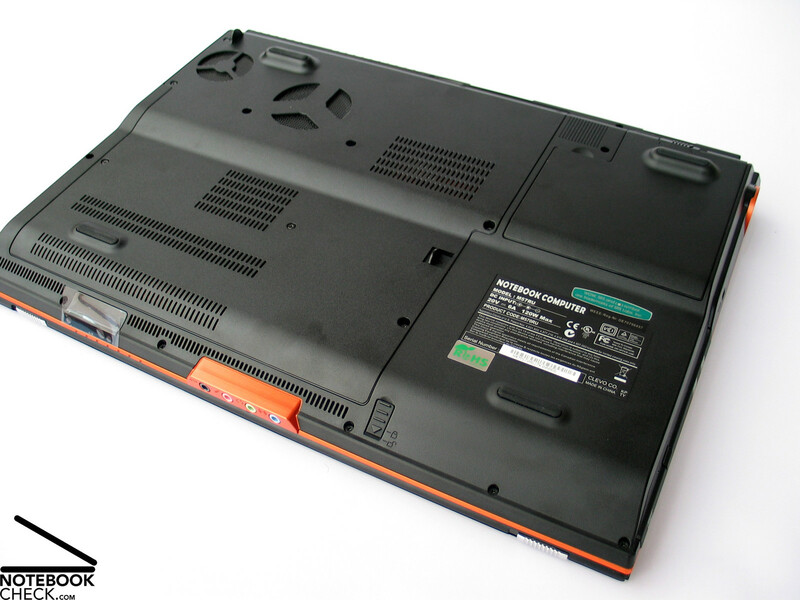 With a maximum of 134.3 cd/m2 in the middle upper area the M570TU barebone, with a WUXGA display, positions itself under the already mediocre results of the WSXGA display of the M570RU notebook. The illumination of the screen couldn't really convince with its 76.8%, either. For the record a very obvious diminution in brightness on the left side of the display of down to 103.2cd/m2 should be mentioned. Unfortunately this diminution is also visible to the naked eye, whereas the display in the whole does not seem very bright. Due to the very low black value of only 0.25 cd/m2, the display offers a very good contrast with a maximum of up to 537:1 despite the mediocre brightness. After calibrating the display with help from the Spyder 3 tool from the firm Datacolor, the display reveals in view of the color elucidation definitively to cool and the blue tones outweighed. In the horizontal range, the image is extremely stable in the viewing angle. In a shallow angle, inconvenient reflections appear on the screen. This applies to the vertical viewing angle, as well. A loss in contrast and a change in image related to this were already noticed earlier, though. Schenker didn't go in for any compromises when equipping the XMG7. With the X9100 Core 2 Extreme CPU from Intel, our test-sample withholds the newest high performance mobile processor. 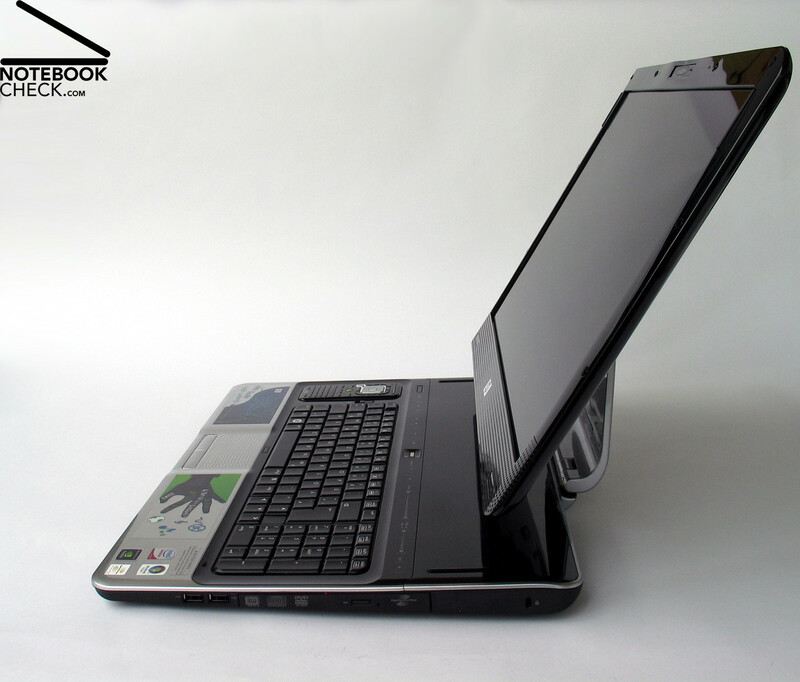 Depending on the needed performance and/or financial possibilities the notebook can be fitted alternately with a P8600 (2.4 GHz), a T9400 and a P9500 CPU (both with 2.53 GHz) as well as the T9600 with 2.8 GHz. More information for the new Centrino 2 Penryn line you can find in this special editorial. In consideration of the graphic card, the customer can choose between two high performance versions. On the one side the Geforce 9800M GT graphic card from nVIDIA with a 512MB GDDR3 video memory and as a top model a 9800M GTX solution with 1024MB GDDR3 memory. Both versions deliver first class performance in the gaming area, whereas the 9800M GT has about the same level as a Geforce 8800M GTX, and the 9800M GTX graphic card can be placed about 10 - 20% in front of that, depending on the application. Both high - end graphic solutions have already been tested in accordance to gaming performance by Notebookcheck.com. 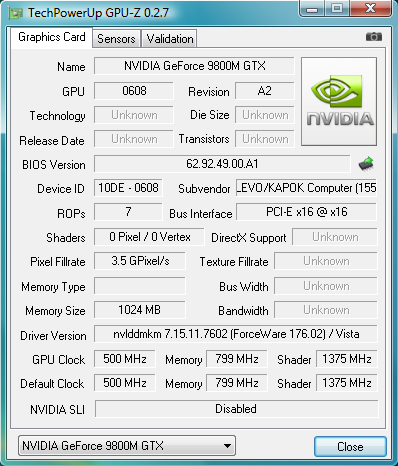 You can find details about the nVIDIA Geforce 9800M GT graphic card in this editorial and more information as well as detailed gaming tests of the Geforce 9800M GTX graphic card from nVIDIA in this review. Barring for the first class performance in the 3D- and gaming area, the XMG7 can score bonus points in the application area because of the built in high performance components, as well. 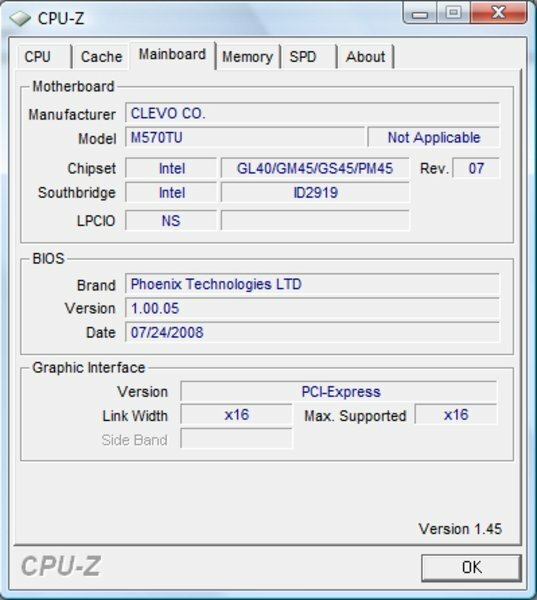 For instance in the PC Mark 2005 benchmark test where the Clevo M570TU barebone achieved first place, from up till now tested notebooks, with 7947 points. The notebook reached a similar excellent result in the Cinebench R10 Benchmark test. 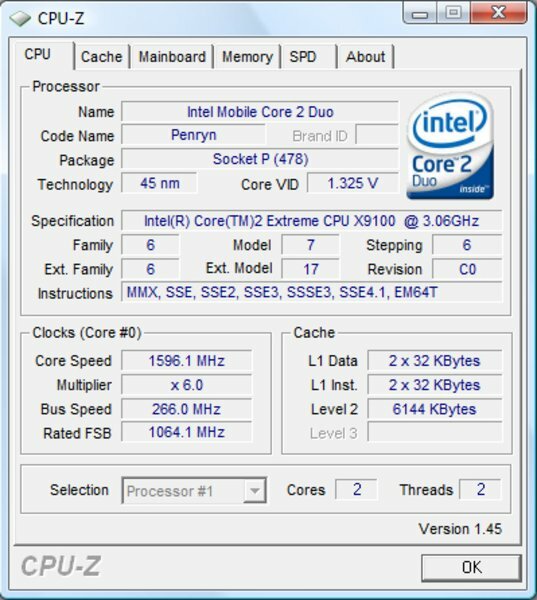 Here, the Core 2 Extreme CPU with 3.06 GHz achieved a peak result in the Rendering test. Besides that the XMG7 with the Geforce 9800M GTX graphic card delivered very good results in the OpenGL Shading test and placed itself only slightly behind the CAD specialist Precision M6300 from Dell with a Quadro FX 3600 graphic card from nVIDIA. Because the Clevo M570TU is built on the new Intel Centrino 2 technology, the faster DDR3 RAM can already be worked with on the notebook. Altogether the XMG7 has a 4096MB fast DDR3 RAM with 1066 MHz divided into two memory modules à 2048MB. 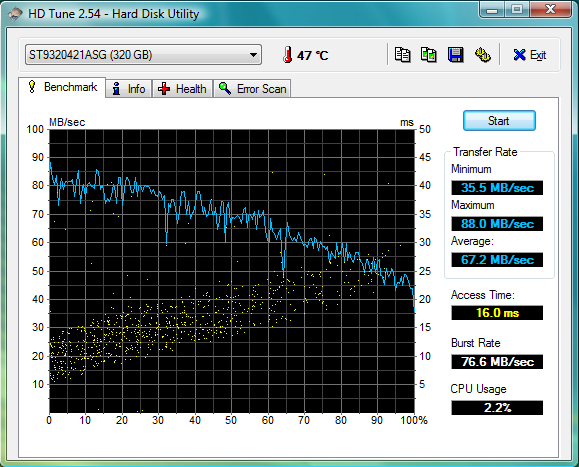 There are quite a few variation possibilities concerning the hard disk available, too. Alternately there is either a hard disk with a capacity of up to 500 GB and a velocity of 5400 rpm or a faster 7200 rpm with a gross capacity of up to 320 GB to choose from. Of course Solid State drives can be built in. The, in our test-sample, built in 320GB hard disk from Seagate (ST9320421AS) showed in the HDTune Benchmark test extraordinary good transmission rates and a low access time of 16 milliseconds. There are barely any surprises hidden in the Clevo M570TU barebone, which is found under a variety of names, available also as the XMG7 Gaming Notebook from Schenker. 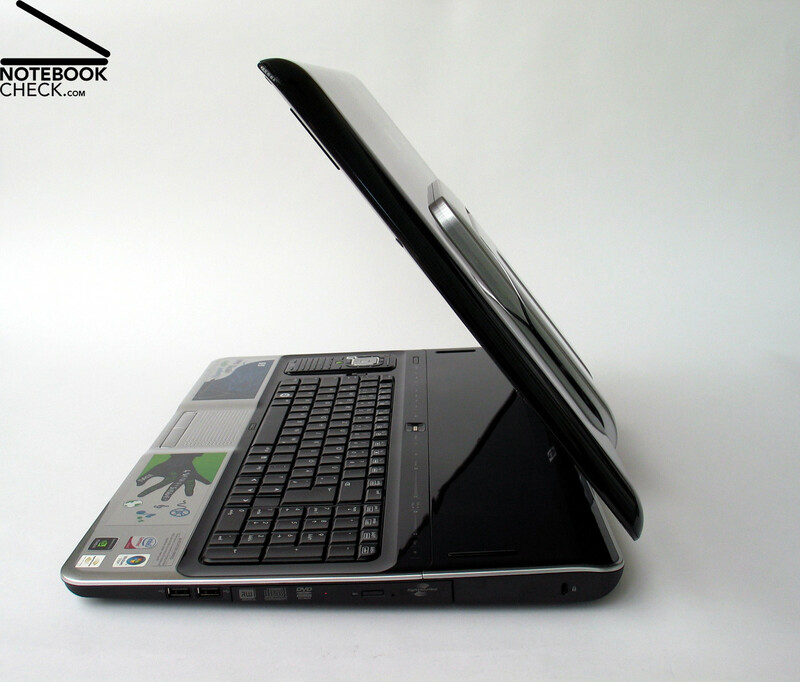 The notebook offers a solid but average workmanship with an all over decent connectivity. 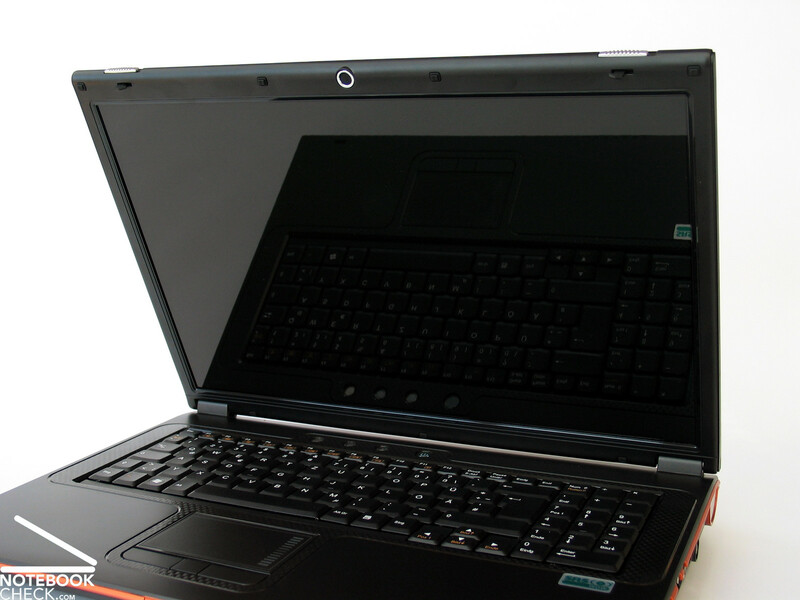 The newest M570TU version comes with a HDMI and an eSATA port. 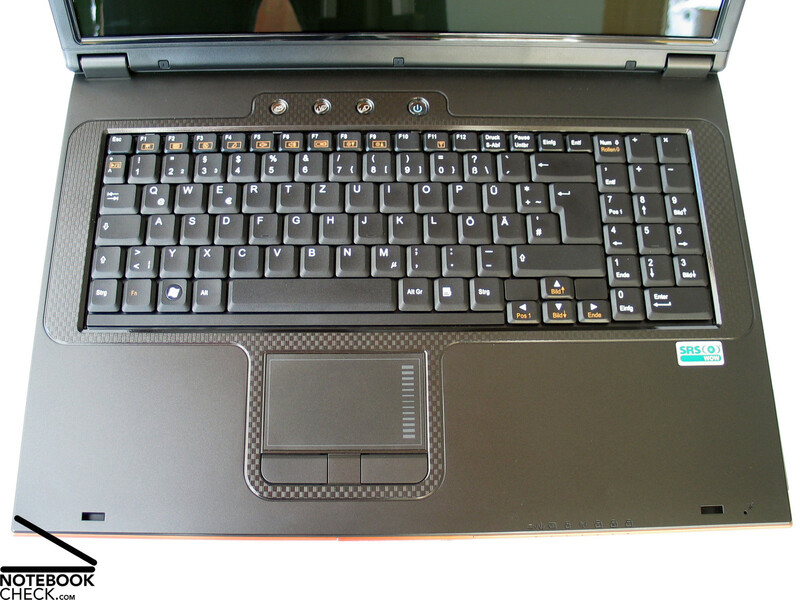 The input devices, especially the keyboard, made a very good impression in the test and are also qualified for various writing tasks next to the main field of computer gaming activity. An, once again, average result was delivered from the WUXGA display, built in to the notebook, with a generous resolution of 1920 x 1200 pixels. As a result the maximal brightness of the display turns out with slightly more than 130 cd/m2 extremely below average. The good contrast value of the screen should be mentioned positvely, though. The main focus of the XMG7 notebook lies, of course, in the available performance reserves. Here the device can make bonus points without any restrictions. 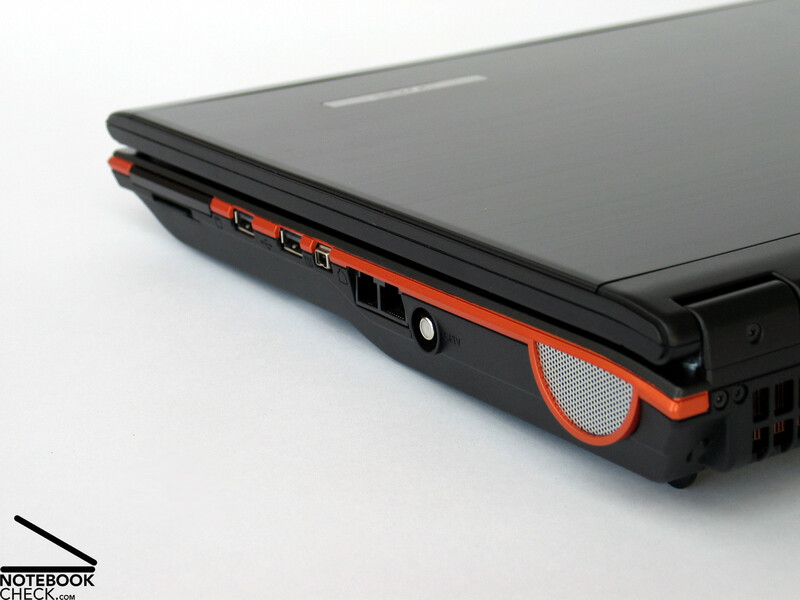 Equipped with an Intel Core 2 Extreme CPU and a Geforce 9800M GTX graphic card, the laptop has the up-to-date most efficient components for use in mobile computers. Therefore, the results of the performed Benchmark tests are not a surprise. 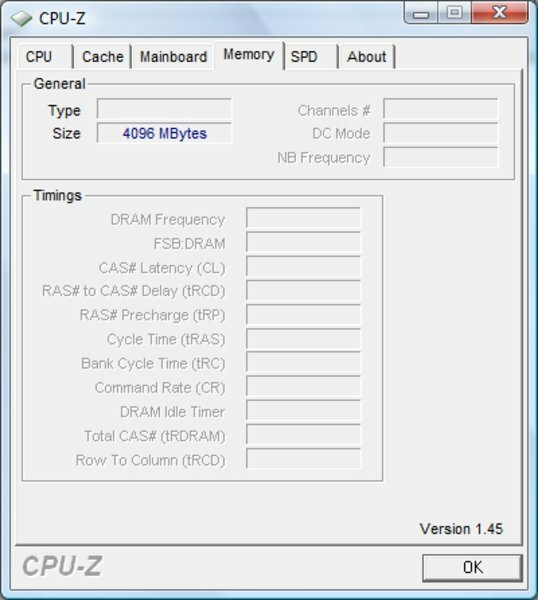 In applications as well as in gaming the XMG7 (Clevo M570TU) provides best values. What almost can be called an anomaly is that the surface temperature remains within a frame, considering the offered performance. What is going on inside of the notebook becomes quickly obvious through the fan. 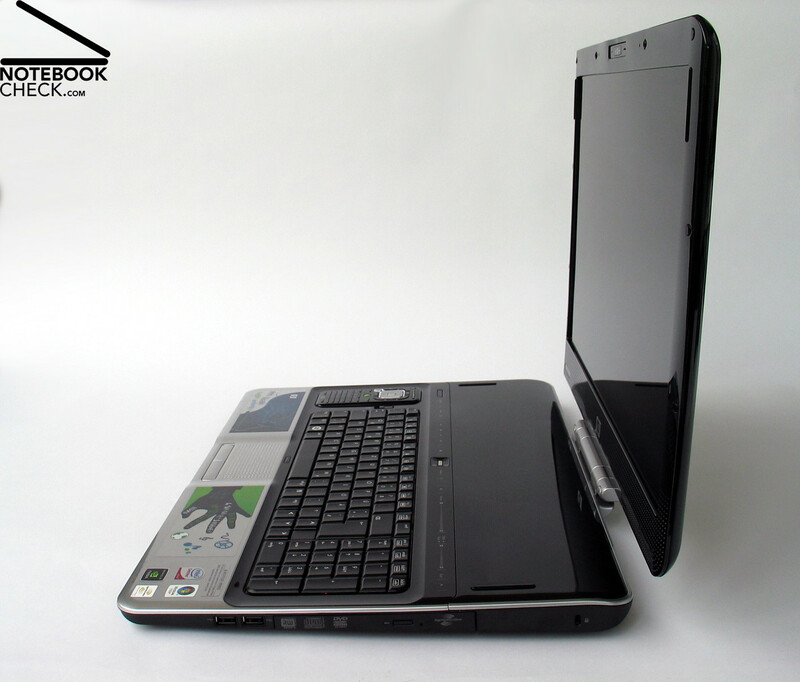 The notebook causes a loudness of up to 49.7 dB under performance which requires quite a bit of getting used to. 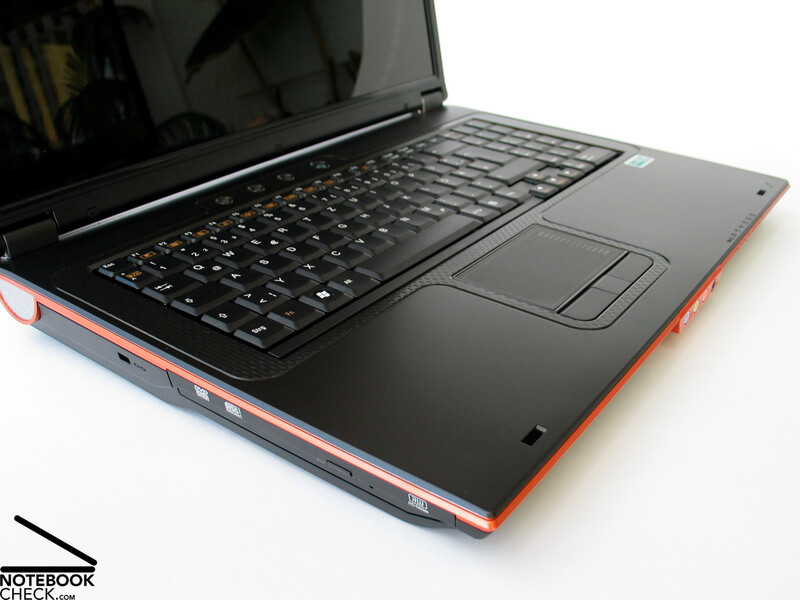 The XMG7 or respectively the Clevo M570TU is an interesting model for the price conscious gamer. The device with the complete equipment like we had costs about 3000.00 Euro, but if one cuts back on the CPU or on the hard disk and RAM, a price of about 2000.00 Euro can be realized, whereas, thanks to the 9800M GTX graphic card from nVIDIA, a first class graphic performance is guaranteed. The mySN XMG7 from Schenker-Notebooks is an old acquaintance. The speakers of the device, placed on the side edges, provide only a moderate sound. Unfortunately this goes to the expense of the sound, which turns out extremely intense under performance. ...as well as a brand new Geforce 9800M GTX graphic card from nVIDIA, the notebook reached peak results in the Benchmark tests. The strength of the XMG7 is quite clearly the extensive configuration possibilities. Although the illumination was rather below average, the display offers a very good contrast. It is very pleasant to use and also has an additional numeric block. There are no changes to be found on the keyboard. Besides the usual standard ports, the new M570TU barebone has an HDMI and eSata connection. The connections that are included can let themselves be seen, too. ... and regarding the case stability, brings a passable result, as well. 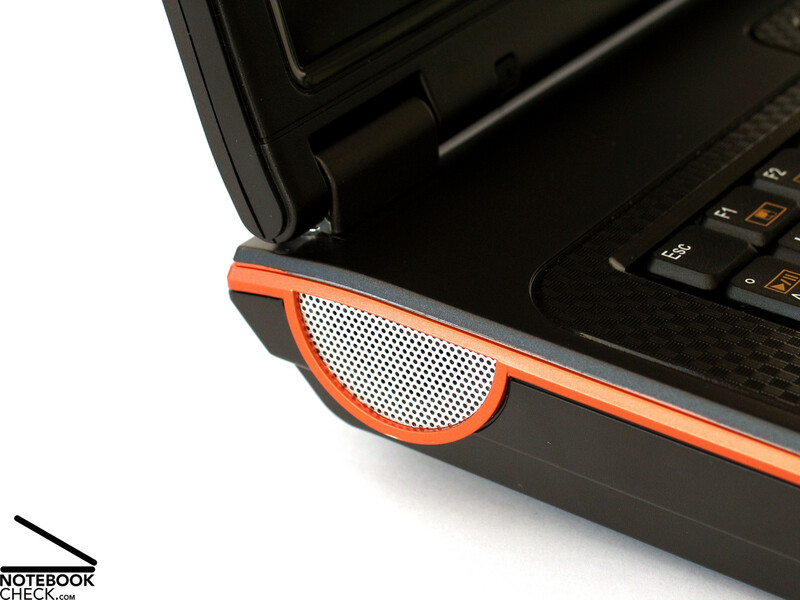 The Clevo M570TU barebone shows itself in the usual case with the distinguishing orange border that runs along the side edges. 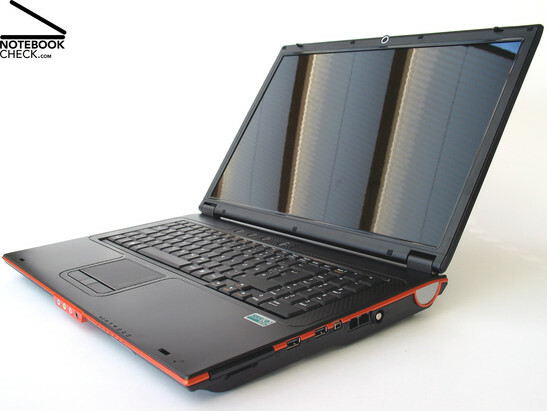 The battery runtime of about 1 - 2 hours, depending on the required performance, is average for a DTR - notebook, as well.